Once there was a dog and a man. The dog chased and the human ran. The dog got leaner, the man fitter. But sometimes got bit, and being bit got bitter. Chased, one day, a bone in hand. The man devised a clever plan. Raising the club, he flung it aside. The dog caught its meal in mid-stride. From that day on man carried meat. To offer dog a tasty treat. Dog, it seems, had trained its master. No more racing to get faster. Thirty thousand years then past. Pavlov trained at dog at last. Humans are slow, but can learn. As the world, in due time, turns. Taken in July of 2010 in Cuzco, Peru. 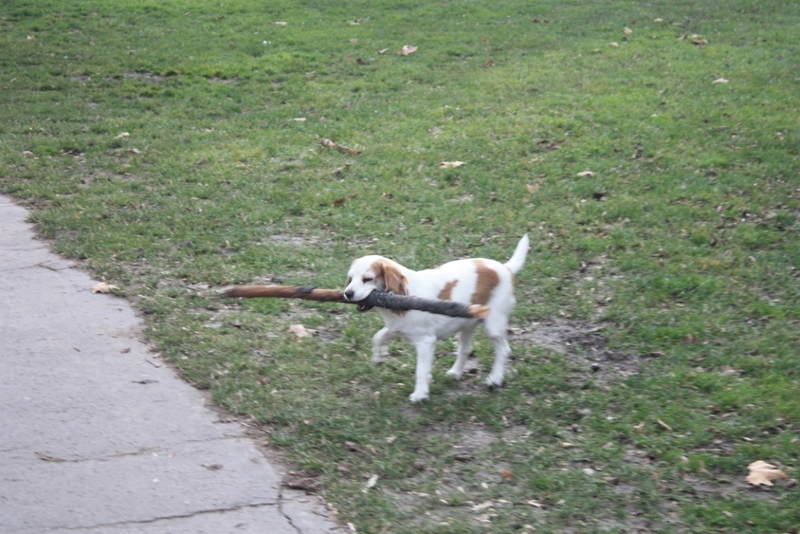 I watched this little dog carry this stick across Budapest’s City Park. He set it down once, or maybe twice, to regrip it in its teeth, but otherwise it kept trotting along. 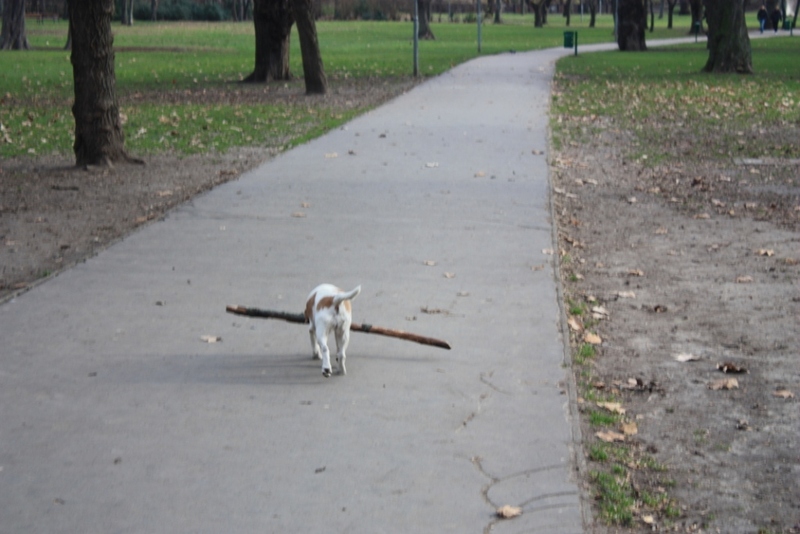 The stick was about 1.5 times the dog’s length and about the diameter of a woman’s wrist. The expression goes, “Don’t bite off more than you can chew,” but I applaud that this puppy was willing to shoot for the stars. Taken in April of 2014 in Bangalore. 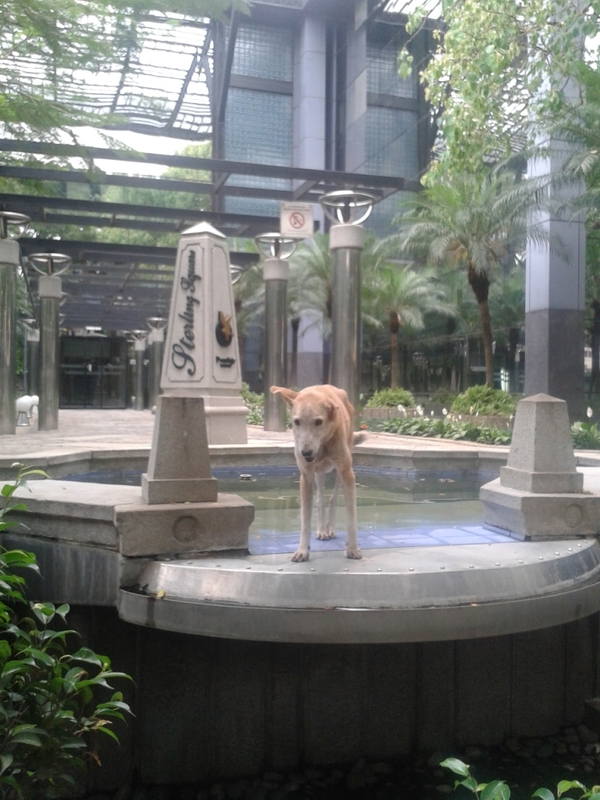 Saw a dog doing its business in the fountain of a swanky office building the other day. If that doesn’t capture the spirit of Bangalore, I’m not sure what does. 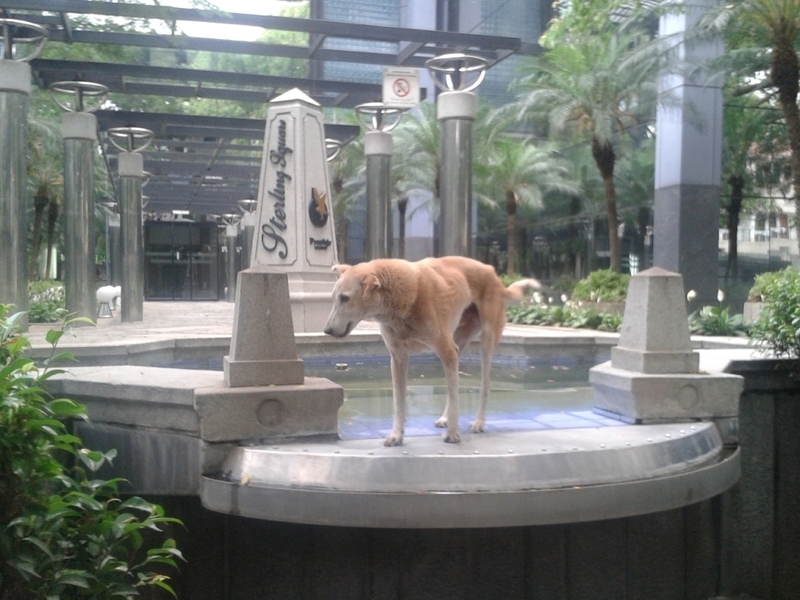 DAILY PHOTO: Doggie Attire in the Tropics… Really? Taken in January of 2014 at Patong. Anthropomorphize much? 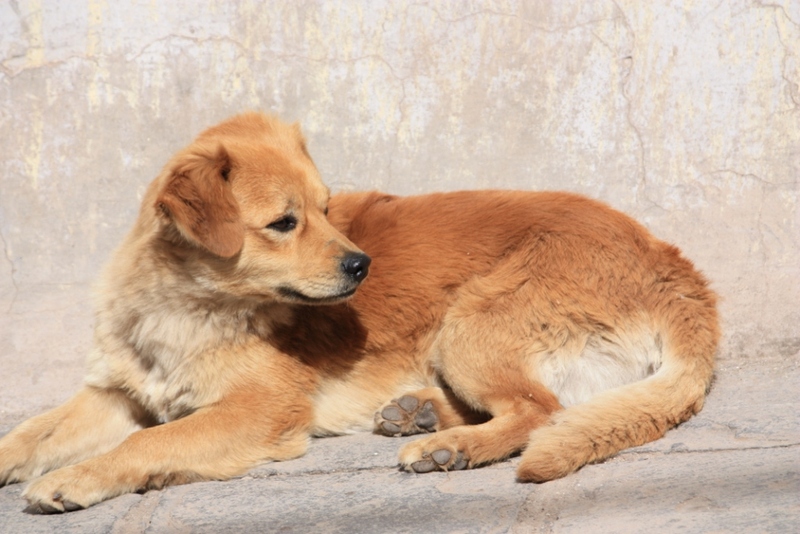 Have you ever noticed how dogs and cats have hair all over their bodies? Furthermore, have you noticed that they shed during warmer seasons and grow hair more thickly in the cooler seasons. So what on earth makes people feel the need to torment their pets with clothing? 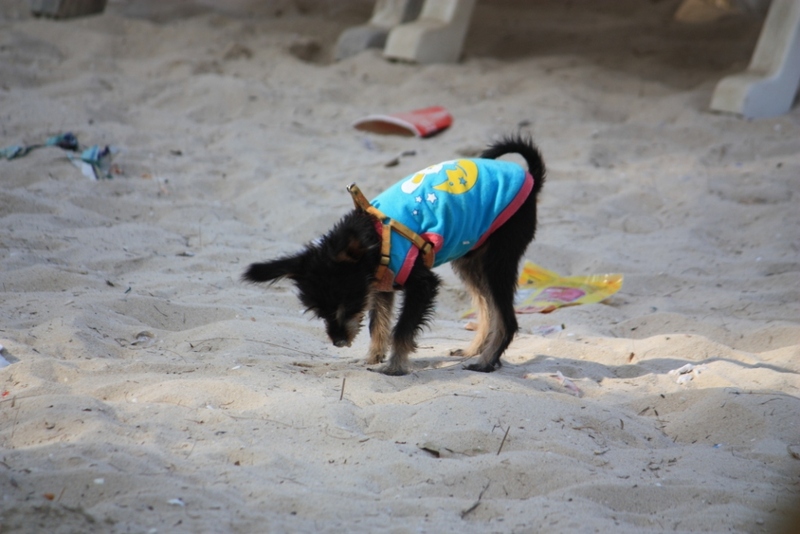 OK, I might be able to understand if you live in a cabin in the Alps and you’ve got a shivery pup, but this photo was taken on the beach in Thailand. Dogs of the world unite in the cause of canine nudism.